The unique course of the river Nile has influenced the religion of ancient Egypt in a very typical manner. The Nile effectively symbolized the essence of their religion. 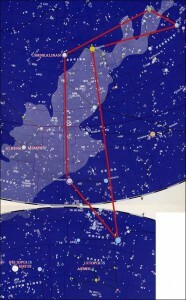 There are essential texts, pictures and geographical clues that show a link with the stellar religion. Their most important deities, Osiris, Horus and Seth and other gods are constellations or stars. So far, this connection has not yet been made. The Greek writer Plutarch wrote in Isis and Osiris 33 that the most scholarly priests identified the river Nile with Osiris. In a remarkable article by the French Egyptologist Daressy (BIFAO XII, 1916), one can read that the Egyptian priests looked towards the starry heaven to discover similarities with the Earth. For they were the priests who believed that the Nile was a celestial road that had literally descended on earth. Until now, Egyptologists assumed that the priests were referring to rainfall, yet that proves to be an error. The main problem was to relate Osiris – Plutarch claimed he was cleft into 14 or 16 pieces and labelled as the God of Death and Resurrection – to the sky. My research was furthermore obstructed by the prevalent conviction that Osiris is Orion, a conviction which happens to be just as erroneous. 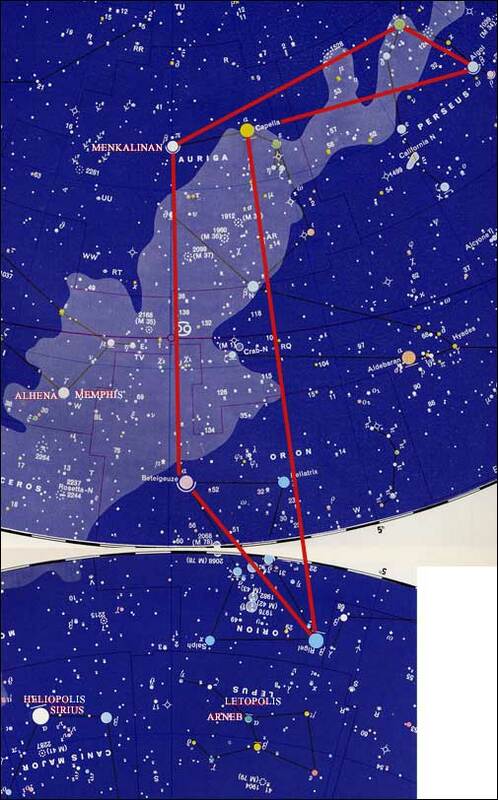 On the ancient Egyptian plaque of Denderah, Osiris, the god of Death and Resurrection, is depicted near the edge, below the constellation Scorpio (see Subpage 4 for further details) Another explicit clue regarding the stellar origin of Osiris can be found in astrology, i.e. religious astronomy, an ancient science that belongs amongst / has its roots in the ancient cultures, especially the Egyptian. According to this astrological science, concepts such as Death and Resurrection were and are linked to the constellation Scorpio. Scorpio consists to this day of sixteen stars, the same number found in Plutarch, where he describes the extent of Osiris’ dismemberment. Hence, Osiris is the constellation Scorpio. 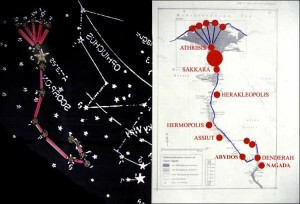 The constellation Scorpio, when mirrored, corresponds with the course of the Nile, from the Delta up to Denderah. 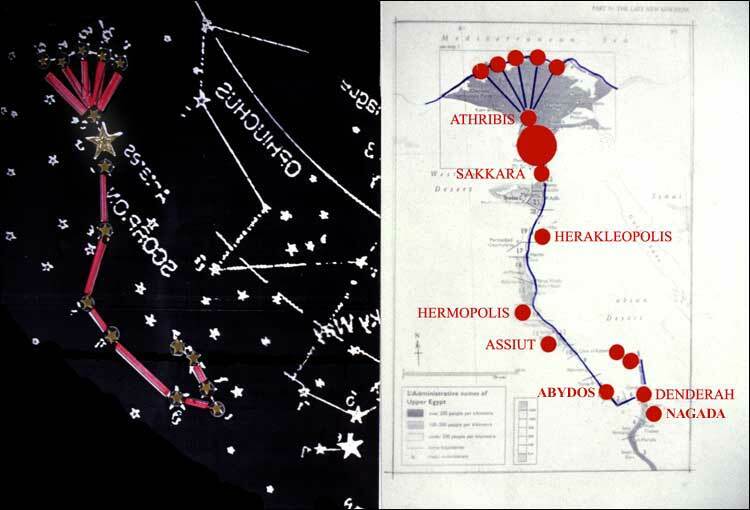 Archaic settlements correlate with the constellation of Scorpio, as well as the five mouths of the river Nile (Fig. 9). Several Pyramid Texts, and findings in the temples of the ancient cult centres of Osiris (e.g. Abydos), where his relics were kept, confirm my assumption that Osiris is identical with the Nile, and that his son Horus is related to Orion. This implies that the ancient Egyptians may have used a mirror or a viewer to observe the stars in the nocturnal sky and hence noticed the correspondence between the river Nile and the constellation Scorpio. Indeed, the geographical surface of Egypt, including the course of the river Nile, is the earthly temple of the cosmos. Isis and Osiris 22 (p.55), Plutarch mentions the direction in which the boat of Osiris was sailing. Symbolically, the boat of Osiris, also called the boat of Sokar, sailed the river Nile, heading for the stars of Orion and Sirius. The shape of the boat corresponded to a constellation (Fig.10), and was furthermore outlined by pyramids of the third Dynasty up to and including the sixth Dynasty and also of the twelfth Dynasty. Numerous Pyramid Texts (§138, 620, 1824-1826, 1966, 1970) describe the boat of Osiris and the connection between Horus and Sokar. Religious astronomy, iconography and geometry were part of the framework of the Egyptian culture at its very beginning.